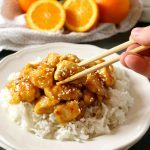 This Easy Healthier Sesame Orange Chicken is the perfect Asian-inspired weeknight meal that's better than take-out and a healthy choice for the whole family! Make it in 15 minutes or less! Add the chicken breast cubes to a medium bowl along with the cornstarch and flour (and salt and pepper, if using). Stir to coat. Set aside. Heat a large skillet over medium-high heat and while it's heating whisk together the orange juice, marmalade, soy sauce, garlic, ginger, rice vinegar, and cornstarch until well combined. Set aside. Once the skillet has heated, add the oils and then the chicken coated in the cornstarch and flour. Brown the chicken in the skillet until each side is crispy and golden brown and the chicken is cooked through. Pour the orange juice mixture over the chicken in the hot skillet and toss the chicken in the sauce until it thickens. Serve over rice with a side of steamed veggies. Garnish with sliced green onions or sesame seeds (if desired). Feel free to use more cornstarch in place of the all purpose flour if you stick to a gluten-free diet. The added flour helps the chicken get extra crispy, but it's not necessary.